An artist rendering of the Oval+. At the turn into the 20th century, architects and urban planners used the City Beautiful Movement to create beauty and monumental grandeur in American cities, with the ultimate aim of promoting a harmonious social order. Philadelphia's Benjamin Franklin Parkway was a product of that movement: carving a sweeping line from City Hall past a series of cultural institutions and sculptures to the vast green of Fairmount Park. Today, we understand that grand architectural gestures, however lovely, are not enough to make a great and vibrant public space. For that, you need people. In January 2013, the nonprofit design group PennPraxis analyzed usage of the Parkway and concluded that there was an opportunity to create "more park, less way" along this mile-long boulevard. 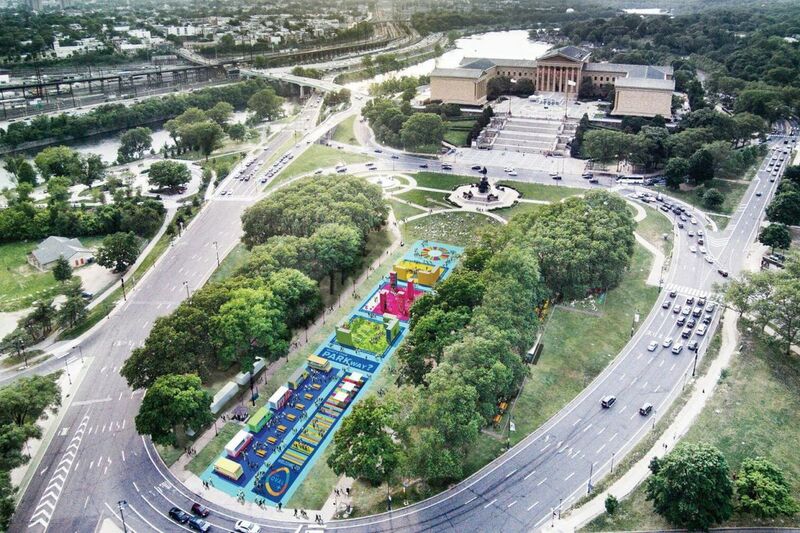 That idea prompted Philadelphia Parks and Recreation and Fairmount Park Conservancy to transform Eakins Oval at the top of the Parkway from a year-round surface parking lot to the summertime park space known as the Oval. Each year since summer 2013, through live music, movie nights, yoga classes, activities for kids, mini golf, and a beer garden, we have seen the Oval become a space for Philadelphians to connect and have fun. Perhaps most exciting, we recognize that the vibrancy we see there every year is but a microcosm of what can happen all along the Parkway. Now in its fifth season, the Oval will reopen July 20 as the Oval+ with an expanded footprint encompassing nearby Aviator Park and the newly renovated Shakespeare Park. The theme this year ("What's your Parkway, Philly?") asks visitors to envision spreading the Oval's life all up and down this beautiful artery. If you visit between opening day and Aug. 20, you'll see a set of three-dimensional installations by the design firm PORT Urbanism created to get visitors thinking about potential uses of the Parkway beyond Eakins Oval. We'll have a number of ways to record your ideas, from a large-scale chalkboard on site, where you can literally draw your suggestions, to a form at theovalphl.org where you can submit comments. It might seem obvious that we, as park professionals, would want to put more park into the Parkway. But why is that so important? Beyond providing critical green space and opportunities for recreation, good parks build a sense of community, increase public safety, and contribute to the economic development of our city. When you're dancing with the stranger next to you at an outdoor concert, or watching your toddler play in the sandbox with a new set of friends, or sharing a picnic table with recent immigrants, it becomes easier to remember what unites us as people, as Philadelphians — and as Americans, too. In September, the city will kick off a yearlong celebration of the centennial of the Parkway. Times have changed, but this graceful thoroughfare is still ours for the making. The Oval has taught us that the Parkway is at its best when residents from all over the city are walking on it, biking on it, eating on it, playing on it, and owning it as their collective piece of Philadelphia. We want to know what will bring you out, what will make you want to bring your out-of-town visitors here, what will entice you to stroll its length and take advantage of the great attractions along its edges. What's your Parkway, Philly? We want to know so we can help you build it.